This is a very interesting and useful pattern in practice. I haven’t seen any books for classic patterns to talk about this. But I think that it should be a classic one for caching. To make it clear I think that it is an old pattern. I do not invent it and I do not discover it. I designed the solution for our problem then I realized that it should be a pattern. I just want to write it down since I didn’t know it is a pattern before designing the solution and the pattern is useful in real world. More importantly the solution was not so obvious to me before I did the work so it is worth writing it down. You have a not scalable data source which has relatively stable data (e.g. config or metadata) but the data does change. You have many servers (front ends and backends) to access that data. Since the data source is not scalable you need caching. You want strong consistency between the servers. i.e. when one server sees a new version of data all other servers need to see the new version or newer version(s). Simple put it is shared caching. First you may ask why I didn’t use Zookeeper or equivalent service. Yes that would be ideal if it is available. Sometimes it is just not available in your project but you need to solve this problem. Take a look at the old design as below. 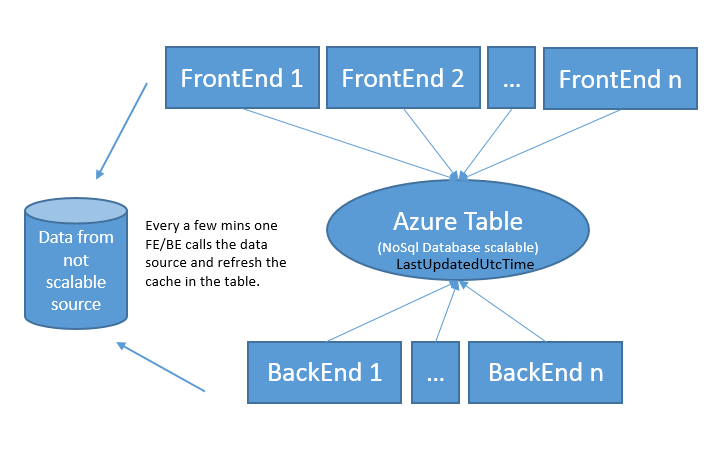 Azure Table was used for the shared caching. It is very scalable and actually fast than many people thought (tens of milliseconds for each access). A local refresh time is introduced so clock skew doesn’t matter anymore. so every a few mins one server will refresh the blob and all other servers will get the data from the blob and reset the local refresh time. The new design solved our problem very well. The code for this pattern is not much. I left out some technical details on purpose so readers can think about them. Please try to answer the below questions. What do you use for the version number? How to update it? Should you keep the version in a NoSql database or with the blob? How about concurrent reads and writes on that single blob? We have hundreds of servers. What is the limit? What is the right exception handling? The data source, the blob or the servers might be down. What tracing do you need for live site troubleshooting? Are you confident in doing it in a hotfix? or you would rather do it in a major release. 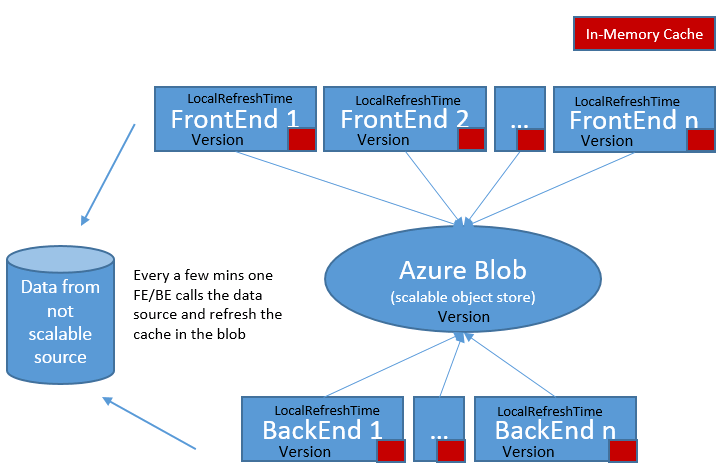 This entry was posted in Uncategorized and tagged Caching, distributed systems, Two Tier Caching on July 3, 2014 by Paul Lou. I have been working on building cloud computing infrastructure as a developer for a few years. Overtime I came to realize that distributed systems play a vital role in cloud computing. In some sense cloud computing is really about building distributed systems and making them available to the public in the model of utility computing. Once I realized that I started to spend more time on researching on large scale distributed systems. It turned out with no surprise that distributed systems are pretty complicated and the learning curve is steep. It really takes time and effort to understand the fundamentals and the real production distributed systems. I always believe that sharing my learning experience will help people who want to learn and also help me learn more. This is why I want to write blogs regularly to share my experience. Distributed systems and cloud computing are huge topics and there is a lot to talk about. Here is my plan for sharing my learning experience. First I would like to talk about the basics and fundamentals of distributed systems like consensus problem and Paxos algorithm, CAP theorem, DHT (distributed hash table), distributed file system and so on. The reason is that without a good understanding the fundamentals it would be very hard to understand distributed systems. If you don’t believe me try to read any of the three papers (azure storage, dynamo, spanner) to see how much you can grasp. If you can understand all of them you don’t need to waste your time on reading my blog. Otherwise I believe that you can learn something from my blog. One of my goals is that you will be able to at least understand all the 3 papers I mentioned. After talking about the basics and fundamentals of distributed systems I will talk about real production distributed systems like Big Table, Chubby, Spanner, Dynamo, Azure Storage, Cassandra, Zookeeper, Hadoop, Storm and so on. Then you can understand how real systems are built on top of the fundamentals, what are the engineering challenges and how they get solved. Believe me that there is a big gap between theory and practice in distributed systems area. The real systems need to fill the gap so you will see many interesting things by looking into the production systems. Once we know enough about distributed systems I will talk about cloud computing which is a pretty hot area. I will probably not follow the exact order of finishing talking about distributed systems fundamentals first, then real distributed systems and then cloud computing. Instead I will talk about these topics in an indeterminate order. I will try to blog on a regular basis. In the end people who follow on my blog should have a very good understanding of distributed systems and cloud computing. It should be helpful for job interviews, your projects at work, your curiosity about technologies and many other more cases. This entry was posted in Uncategorized and tagged cloud computing, distributed systems on February 11, 2014 by Paul Lou.